I took along my polar outfit and…a few photos. We sat around talking about going to Antarctica, and filming penguins and other animals. The kids are great fun, and their knowledge amazed me. I was lucky that Wellington photographer Kat Grooby popped in for moral support. She’s used to kids, thought it worth a watch, and kindly took a few photos. We left with the kids excitedly playing outside at sailing to Antarctica on the gym, while other kids carried an injured ‘invisible’ penguin off to hospital. Their enthusiasm was infectious, and their creativity flowed back into me. I walked away with a nice feeling that I’d enriched the kids learning; but they’d unexpectedly made my day brighter, happier, and had reminded me of important things. Many thanks. 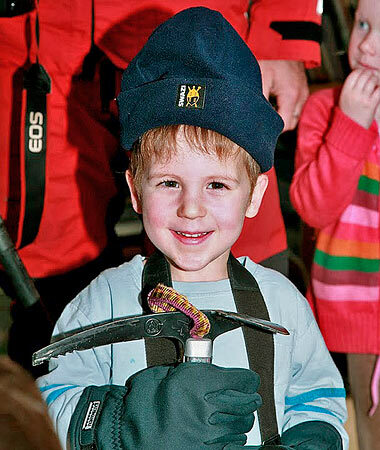 A young polar explorer - maybe a Robert Swan in the making? Found an apt Buddhist saying: “If you light a lamp for somebody, it will also brighten your path”. Yesterday I went with Rob to watch him talk on the Antarctic to a local preschool in Wellington. He’s used to speaking to adults, so 3 and 4 years olds were out of his comfort zone. But he was a natural and spoke for half an hour, interacting and having their attention for the whole time. His wonderful photos were shown on a slide show to illustrate places and wildlife. They were very bright children and were able to answer his questions about the environment and animals. 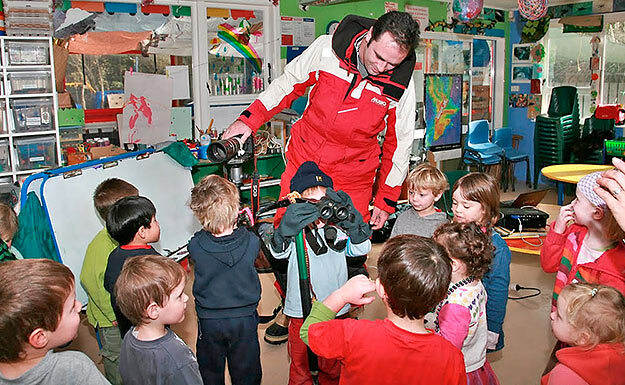 Rob dressed up in his Antarctic attire and showed the children some of the important equipment such as ice axe, binoculars, and they were excited to hold the tools. He talked of the importance of loving and caring for the animals. As we were leaving a number of children were digging with their ‘ice axes’ in the sandpit while others carried their penguins to safety. He obviously left a lasting impression. We try and incorporate ‘giving back’ into our business, especially by supporting important things, such as environmental, conservation and social causes. It’s a satisfying aspect to our day to day, and the ‘payment’ or return on this is often beaut. I call it ‘the juice of life’. Are you giving back? Hope so. Nice post Rob. I love your attitude and your willingness to share your enthusiasm for your passions with others. I wonder how that injured penguin is doing?? Thanks for the blog post. I showed it to the kids and they were all very excited to see it, as were the teachers. The children are still “playing Rob’s” as they call it, pretending to go to Antarctica and take photos. Hey that’s awesome Rob, those kids were obviously so excited by your visit. You are right about how important it is to give back to others; I wish more people shared the same philosophy. You're reading Are you giving something back? It’s the juice of life at Nature’s Pic Images Blog.